The Vietnamese-French master in applied Mathematics is ten years old. This conference's first aim is to celebrate this event. Many former students of the program had followed it by a phD and have a post-doc position somewhere in the world. The conference will also be an opportunity for younger students to meet the older and learn from their experience. Of course the conference will also be an opportunity for the students to meet again their teachers. 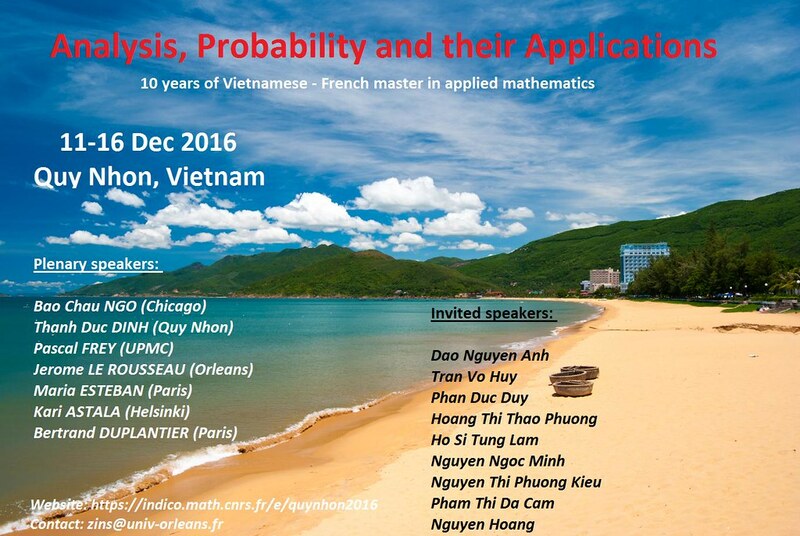 The master was buit as a tool for Vietnamese-French cooperation in mathematics and many former students of the master have come back to Vietnam as lecturers in a university: meeting the french actors of the master maybe an opportunity to catch up with the research project they have started during their phD. Apart from this, some distinguished mathematician will give talks about various applications of mathematics, from physics to industry, thus showing a sample of the contemporary trends in mathematics. Priory to this conference, a one-day celebration of the event will be held at the Vietnamese National University in Ho Chi Minh City on friday december 9. Further details will be given later. Transportation to Quy Nhon from HCMC will be organized on saturday december 10.